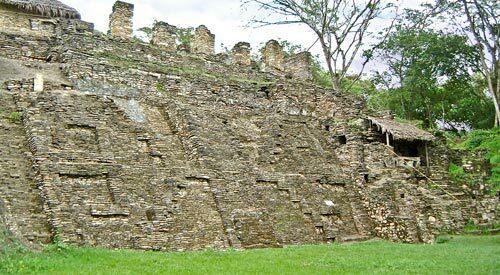 The Frieze of the Bird Dancers is located high up on the fifth terrace of Tonina’s enormous pyramid acropolis. The frieze portrays two near identical figures that stand in mirror image of one another and are dressed in voluptuous feathered outfits. The bent innermost knees and arms, combined with the outstretched outer limbs, give a clear impression that the pair are dancing. The pose is also very similar to that struck by players of the sacred ball game as they volley the ball to and fro. It is possible that the pose is deliberately ambiguous and that the dance is a celebration of the game, which is known to have been an integral part of life and the history of Tonina. The Bird Dancers wear feathered wings that can be seen emanating from their innermost shoulders – this is particularly clear on the left character (see fig. W0450). Long feathered tails also trail behind them and feathers plume from their headdresses. A large number of legends and images can be found amongst the corpus of Mesoamerican mythology that may relate to the Frieze of the Bird Dancers. The closest match is perhaps the Hero Twins, Hunapu and Xbalanque, who are closely linked to both the ball game, dance, and the Maize God, One Hunapu, who was their father. The Hero Twins were also renowned bird hunters, which would explain the voluptuous feathered outfits seen on the Frieze of the Bird Dancers. They are also twins, of course, which would explain why the pair are portrayed as a near mirror image of one another. Their defining moment was defeating the Lord’s of Xibalba by performing a death dance during which Xbalanque sacrificed Hunapu and then brought him back to life through dance. The Lord’s of Xibalba were delighted at this trick and asked the twins to perform it on them. 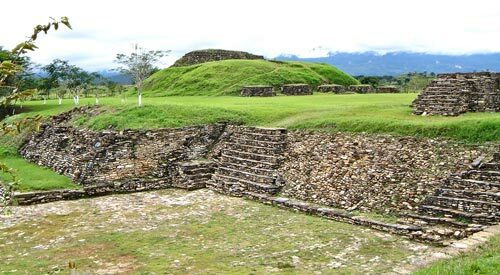 And so the twins sacrificed the two leading Lords of Xibalba, but then left them dead and thus defeated them. 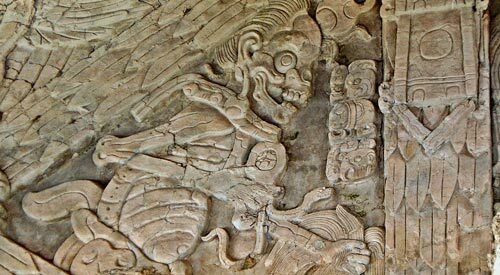 With the Lords of Xibalba defeated, they were then able to resurrect their father, the Maize God. 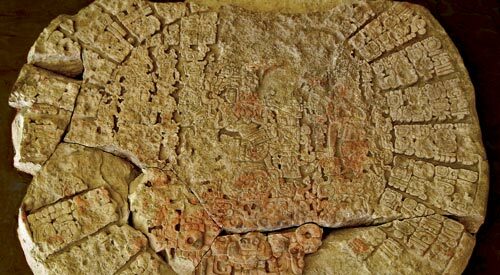 Therefore it seems most likely that the Frieze of the Bird Dancers is dedicated to the actions of the Hero Twins and the resurrection of the Maize God. 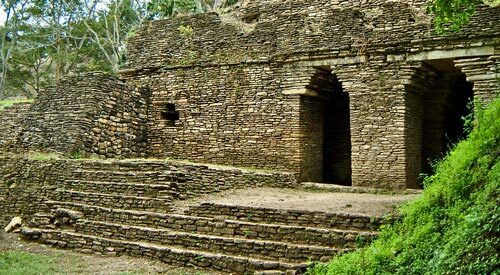 Serving a dark ritual purpose, the eerie Palace of the Underworld is a mysterious labyrinth of 11 passageways that weave beneath Tonina's pyramid acropolis. 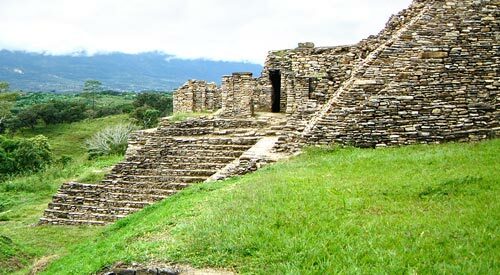 The huge stepped fret motifs found on Tonina's Palacio de las Grecas remain a mystery, however they were probably designed to broadcast the city's belief in a lifecycle, or spiral, of violence and death. 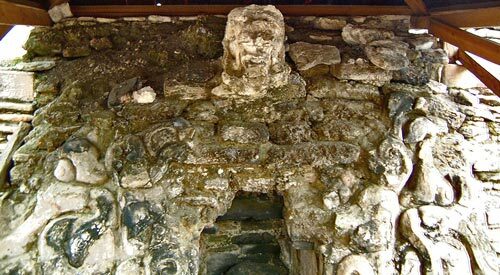 Although badly ruined, the Temple of the Earth Monster's altar still reveals a mysterious beast that may represent the sacred lineage of Tonina's rulers.